It’s a beautiful sunny morning here in Utah. I think summer is finally upon us….hippity hip! There is a chance of thunder and lightning in the for cast for today….. But I’m not going to let that put a damper my spirits. can’t hurt anyone now can it! Ok, so it might be bad if you happened to be riding a roller coaster at the time it hit…. and I get struck by lightning. Let it be known that I started out with a bright and cheery attitude this morning. Bake a batch of these muffins for me,would ya. It might be an electrically exciting day. 1. Into a medium sized mixing bowl combine the flour, sugar, baking powder, baking soda, and salt. 2. Scrape the zest off your lovely lemon. and add it to the dry ingredients, stirring to combine. and add them to the dry ingredients, tossing to coat. 4. Juice your lemon. Pour the juice into a medium sized bowl with the egg, buttermilk, oil, vanilla and lemon. Whisk it all around to incorporate. 5. Pour the wet ingredients into the flour mixture. 6. Stir just until combined. 7. Line your muffin with paper holders then spray the insides with cooking spray. 8. Spoon the batter into the pans. These muffins don’t rise up a lot, so don’t be afraid to fill them almost full. 9. Bake at 375 degrees for about 20 minutes, or until the tops are golden brown and a toothpick inserted in the middle comes out clean. Transfer the muffins to a wire rack to finish cooling. While they are still warm whisk together all glaze ingredients and then spoon the lovely glaze over the top of the muffins. I love strawberry and lemon together. Great recipe! Thanks so much for posting such delectable treats! I should never have visited you. ha! Beautiful, beautiful blog — and oh, the food! I'm eager to try so many of your recipes. I'm visiting (and following) from Home is Where My Story Begins. I love slat, I always add to my Muffins hahahaha. I am making these right now. LOL I couldn't wait! One thing I noticed is that in the directions, you left out the vanilla. I just added it in with all the other wet ingredients. I can't wait for these to come out of the oven! WOW looks so good! Can't wait to try them out! Thanks! Thanks for letting me know the vanilla was missing in the instructions…appreciate it! Hope they turned out well. I'm so glad you love slat…..
Oh my gosh, they turned out DELICIOUS! I wish I had cut the strawberries into bigger chunks but that was my fault. So yummy! I made these muffins this morning and they are delicious! 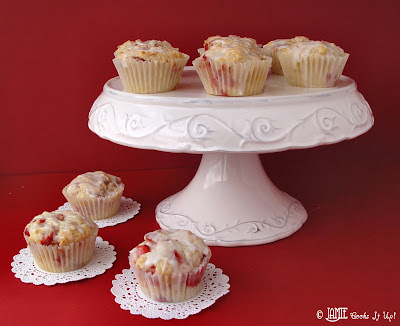 I am a muffin recipe collector – and these muffins hit the top of the list! Yum, Yum! Thanks Jamie! I made these today, SO GOOD! 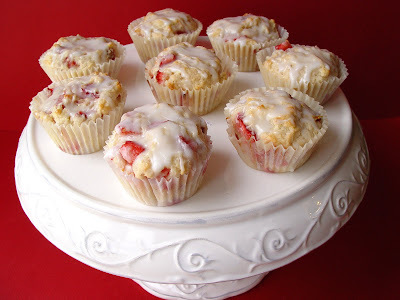 I substituted 3/4 cup Greek strawberry yogurt rather than buttermilk. Worked great! Just made these muffins for teacher appreciation week. They are divine! I'm sure that the teachers will appreciate these! Yumm!!!! Great recipe! Thanks for sharing!